Smart NaMo series of smartphones has been in news for quite some time now. 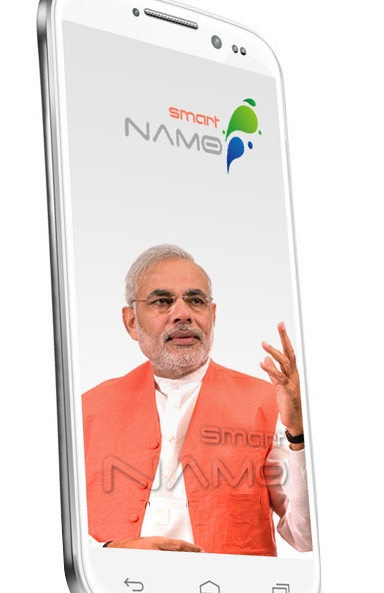 Few weeks back company made Smart NaMo Phablet (Quick Review) or Smart NaMo Saffron 2 official. Finally the first smartphones in this series have been listed on online retail site Snapdeal for pre order. Let’s take a look at what Smart NaMo 1 has to offer. Smart NaMo 1 sports a 13 MP primary camera with auto focus. The 13 MP camera is most that turbo MediaTek processor MT6589T can support. A front camera of 5 MP is also present for video calling. This camera combination is the best we have seen so far in products from Domestic manufacturers. The Internal Storage of this smartphone is also quite impressive at 32 GB. You can further extend it to 64 GB using a microSD card. This storage will be sufficient enough for most users. The Processor in this smartphone is MT6589T turbo processor from MediaTek. This quad core processor has each core clocked at a frequency of 1.5 GHz. The operating frequency Of PowerVR SGX544 MP GPU is also slightly higher than mt6589 SoC. This processor is coupled with 2 GB RAM and thus will ensure smooth lag free performance even with graphic intensive gaming. The battery capacity is 3150 mAh. This battery will be taxed by a quad core processor and a full HD display. Same battery in Saffron 2 will give you talk time of around 2 -3 hrs. With the reduction in Display size by 1.5 Inch, the backup is bound to perform better in this smartphone. The exact talk time has not yet been specified. The smartphone features a 5 Inch IPS LCD Display with 1920 x 1080 Full HD resolutions. This will give you a high clarity display with 441 pixels per inch similar to Samsung Galaxy S4. The IPS screen will ensure wider viewing angles. The Display is further protected by Corning Gorilla Glass 2. The looks of Smart NaMo Saffron 1 are quite conventional. Though not many pictures are available yet to say something with certainty, but the bezel appears quite thin and metallic strip running about the edges make the device more premium. The connectivity features include Bluetooth with A2DP, WiFi, GPRS, 3G, USB , 3.5 mm audio jack and GPS. Smart NaMo Saffron 1 will compete with other Turbo processor devices in the same price range like Intex Aqua i7, Zopo ZP 990, Wammy Passion Z plus and iOcean X7 turbo. Saffron 1 has an edge over all of these devices as far as hardware specifications are concerned. Intex Aqua I7 comes with similar specifications but it has a significantly smaller 2000 mAh battery.